Laragen provides reliable, fast, and affordable STR-based human cell-line authentication services. Our STR cell-line authentication tests comply with ANSI/ATCC ASN-0002-2011 guidelines. Laragen has over 10 years experience working on STR analysis. STR (Short Tandem Repeat) has been used in human paternity and forensic fields for more than 20 years. In recent years, STR-based analysis has been used as the “golden standard” in human cell-line authentication. ANIS/ATCC ASN-0002-2011 recommends eight STR markers and one gender marker in human cell-line authentication: TH01, TPOX, vWA, CSF1PO, D16S539, D7S820, D13S317, D5S818 and Amelogenin. Currently Laragen is using Promega GenePrint 10 and GenePrint 24 kits in human cell line authentication. Laragen provides research and GLP grade (compliant with FDA CFR 21, Part 58) cell-line authentication and Mycoplasma detection. The GenePrint 10 System allows co-amplification and three-color detection of ten human markers (nine STR markers, Amelogenin for gender identification), including D21S11, TH01, TPOX, vWA, Amelogenin, CSF1PO, D16S539, D7S820, D13S317, D5S818.. These markers collectively provide a genetic profile with a random match probability of 1 in 2.92 × 109. GenePrint is an economical choice for confirmation of cell-line identity. The GenePrint® 24 System is a 24-locus multiplex system designed to generate a multi-locus human DNA profile from a variety of human-derived biological sources. This five-color system allows co-amplification and fluorescent detection of the following autosomal STR loci: CSF1PO, FGA, TH01, TPOX, vWA, D3S1358, D5S818, D7S820, D8S1179, D13S317, D16S539, D18S51, D21S11, D10S1248, D22S1045, D2S441, D1S1656, D12S391, D2S1338, D19S433, Penta D and Penta E plus Amelogenin for gender determination. In addition, the male-specific DYS391 locus is included to identify null Y allele results for Amelogenin. Mycoplasma belongs to the family Mollicutes; including, Mycoplasma, Acholeplasma, Ureaplasma, Entomoplasma, and Spiroplasma. They are the smallest free-living and self-replicating organisms. Six Mycoplasma species: M.orale, M.arginii, M.fermentans, M.salivarum, M.hyorhinis and A.laidlawii, account for 95% of all Mycoplasma contamination in cell cultures. Mycoplasma testing is carried out using two methods at the same time point. Detecting Mycoplasma by PCR amplification is highly sensitive and is recommended by The American Type Culture Collection (ATCC) and nucleic acid amplification technique (NAT) is now accepted by FDA as a compendial method for Mycoplasma detection. 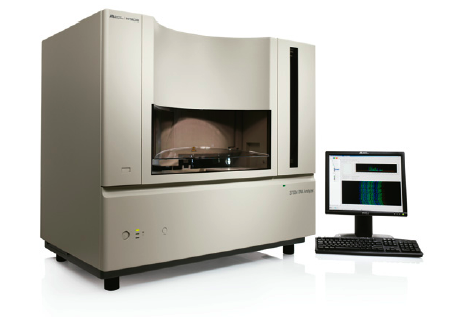 Laragen provides two NAT Mycoplasma detection methods: gel based PCR detection and real-time PCR based detection. We confirm Mycoplasma species by 16S rRNA sequencing when we use gel based PCR method. Both gel based PCR and real-time PCR Mycoplasma detection tests will detect a broad range of Mycoplasma under the European Pharmacopeia (EP) Chapter 2.2.7 and the United States Pharmacopeia (USP) Chapter 63. Laragen provides research and GLP grade (compliant with FDA CFR 21, Part 58) Mycoplasma detection services. We use cytochrome C oxidase I (COXI) gene to identify the species of the cell cultures.